1. All the parts contacting the products are made of AISL 316L stainless steel, the surface roughness reaches R α≤0.5μm. 2. The inner circle of the chamber has a smooth transition without dead corner, no objects accumulated. 3. Consider for user, the structure is easy to clean. 4. 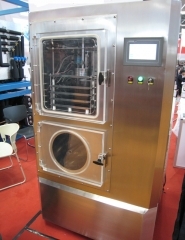 Option for steam sterilization or chemical sterilization. 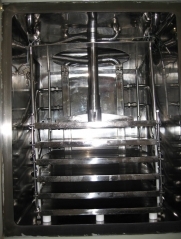 Except for the above, our company can also provide automatic running CIP (on-site cleaning) and SIP (steam sterilization) functions to ensure the high quality of cleaning and the sterilization of the equipment. 1. 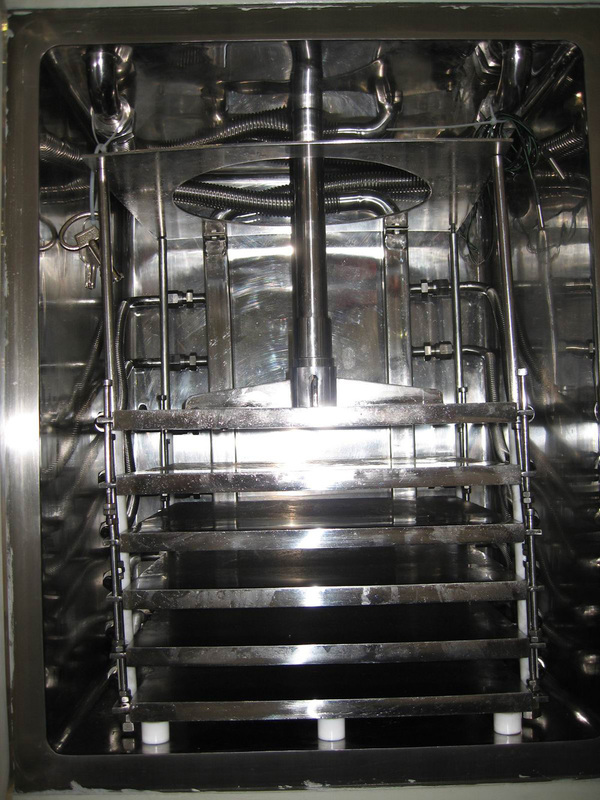 The high-pressure water thoroughly wash inner surface of the chamber and condenser. 2. Equipped with large flow rate CIP pump. 3. Fixed with CIP tubing that automatically drains the residual water. 4. Use rotary and fixed nozzle with 360-degree spray. 5. The hydraulic system uses isolated retractable corrugated tube. 1. Standard configuration, uses double stage oil sealing revolving plate pump. 2. Option: ULVAC or Edwards pump. 3. Equipped with two vacuum probes, for measuring the vacuum level of freeze drying chest and pump respectively. 4. Option: condenser type vacuum meter. 5-1. Drying chamber vacuum level controls the opening and closing of the air inlet valve, introduces the sterilized air from sterilized room. 5-2. Drying chamber vacuum level controls the opening degree of the big butterfly valve to reach the purpose of controlling the vacuum level. 1. The main air switch, transformer and AC contactor fixed in electric cabinet are Siemens products. 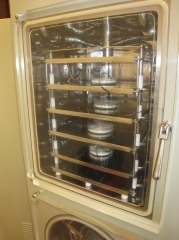 The electric cabinet is secured on machine frame. All machine pump motors are equipped with overheat protection, solenoid valve and heating circuit are equipped with separate protection. 2. 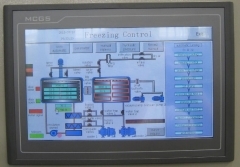 The display screen uses touch screen, PLC programmable logic controller, indicating light, sound-light alarming system and etc. 3. Temperature measuring, pressure measuring, the components can work normally under high temperature, ultra-low temperature and high vacuum level with high reliability. 4. 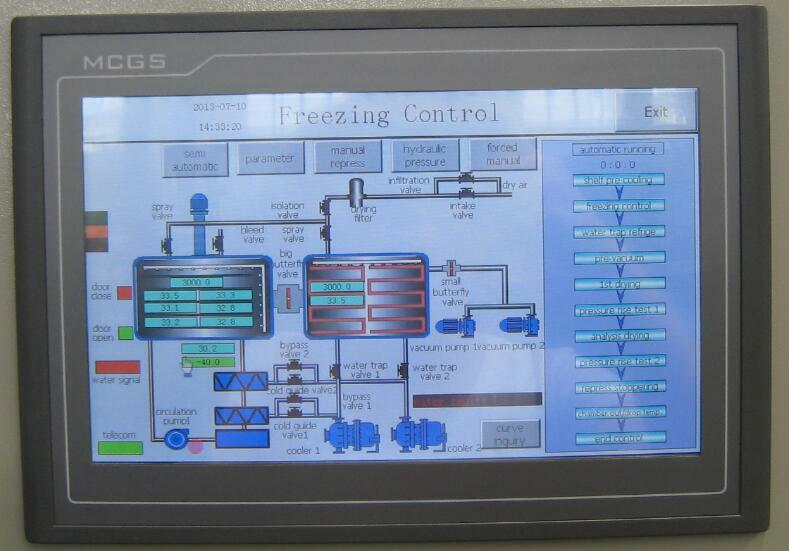 The control system can display the running status of all components of the whole system, and can store and process the operation information and various data. 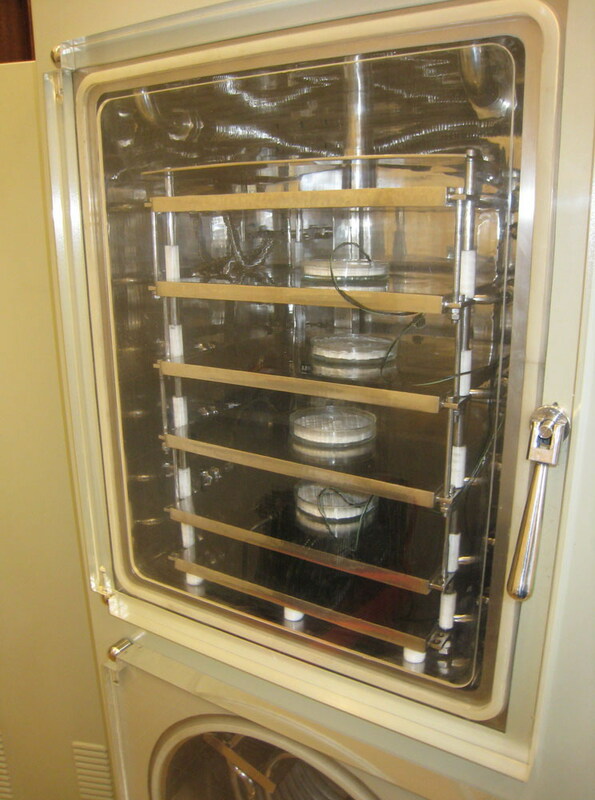 It can provide procedure recording report of whole freeze-drying process. 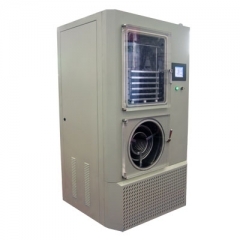 It can set freeze-drying curve, monitor each status in freeze-drying procedure. It can alarm on failure or abnormal situation, provide checking for maintenance, the operator can set and modify data and steps.